A Desktop Printer is a perfect printer for retail applications, back office label printing or small scale labeling operations that require lower print volumes. Unlike Industrial Barcode Printers, these economical printers have a small footprint to easily fit on any desk. Although Desktop Barcode Printers are smaller than Industrial Barcode Printers, they offer the same print quality and similar print speeds. If you are looking for a printer that can easily handle 1000 or less labels a week, the desktop printer is the best option. 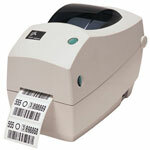 For higher volume print applications, an Industrial Thermal Barcode Label Printer is the better choice. TDP-247, Desktop Direct thermal Printer, 203 dpi, Interface Options: USB, Serial, Parallel, Maximum Print width 4.25". TTP-247, Desktop Thermal transfer Printer, 203 dpi, Interface Options: USB, Serial, Parallel, Maximum Print width 4.25".